Democrats need a big voter turnout on Election Day in Massachusetts if they hope to hold on to the governor’s office when Deval Patrick’s second term is up in January. That point was driven home to hundreds of party activists at a rally in Worcester Thursday headlined by one of the party’s most popular national figures. Former President Bill Clinton urged the activists at the rally at Clark University to make some extra phone calls and knock on a few more doors during the next 18 days to help Attorney General Martha Coakley ,who is locked in a tight race for governor with Republican businessman Charlie Baker.
" I don't care what the polls say. She can win this race handily if you want it bad enough." Clinton likened election campaigns to job interviews, but where the applicants – or the candidates – get to define the job. He argued Coakley has a better record and a better plan.
" You don't need trickle-down economics in the state's economic policy. You need build-out economics. Give people who are poor a chance to work their way to the middle class. You've got a model that most of this country and most of the world would die to have. Don't mess it up." Noting that he was a former attorney general who was elected governor, as Coakley is attempting to do, Clinton said her record as a prosecutor is proof she will keep her word. He praised her support for a law to guarantee workers paid sick leave and to increase state funding to open more classroom space for early childhood education, which is an issue on which she and Baker sharply differ.
" There is no better investment for the future of Massachusetts than getting rid of that waiting list and putting all these kids in preschool, so they have a chance for a brighter future." Clinton decried campaign ads paid for by a super PAC that have attacked Coakley over tragic lapses in the state’s child welfare system.
" You think the people from out of state who are paying for these ads really care about you or your family? Where will they be after the election? They will be gone and you will be left with the consequences for good or ill."
The former president is very popular in Massachusetts, particularly in Worcester. Clinton has now visited the state’s second - largest city seven times — twice while he was in office. He joked that it would not be an election if he didn’t come to Worcester.
" I love this place. I always have. I felt at home the first time I ever came." More than 600 people lined up in a torrential rainstorm to get into the rally and then waited in a muggy auditorium for more than two hours as the weather delayed Clinton’s arrival. 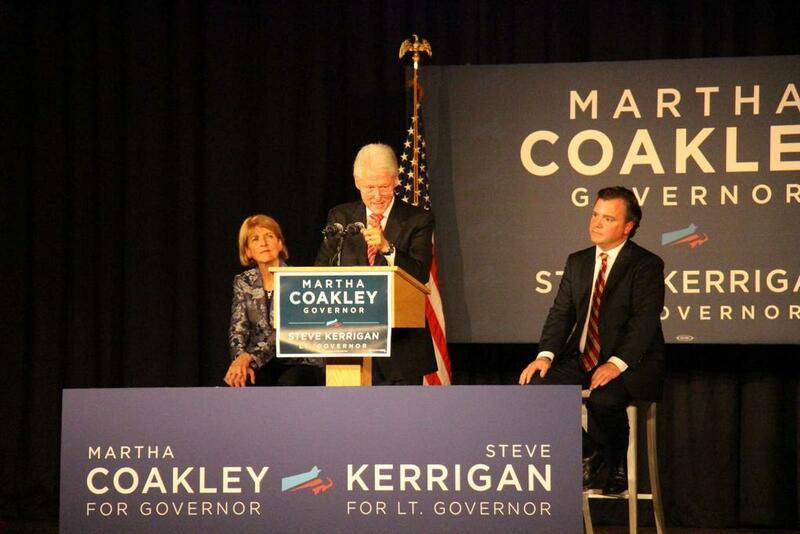 As Clinton spoke on stage, Coakley and her running mate Steve Kerrigan sat in chairs beside him. Coakley’s brief speech at the rally also touched on the importance of a high voter turnout.
" We can win this race if we get out our vote." Democratic voter turnout is typically lower in non-presidential elections when fewer minorities and low income people go to the polls. Bernd Schnitker, a Democratic campaign volunteer, said Clinton’s speech inspired him to work harder between now and Nov. 4th.
" Just the way he talked about the differences between the two candidates and their proposals going forward." Clinton is the second national Democratic figure to jet into Massachusetts to help Coakley. Michelle Obama spoke at a campaign rally in Boston two weeks ago. Vice president Joe Biden is scheduled to campaign with Coakley next week. Hillary Clinton is also reportedly lined up to campaign in Massachusetts. It is not known if President Obama will make an 11th hour visit to boost Coakely’s campaign as he did in 2010 when she went on to lose the special U.S. Senate election to Republican Scott Brown. Baker can’t call for much outside help on the campaign trail as most of the Republican party’s national luminaries are disliked in Massachusetts. Former Republican Gov. Mitt Romney held a private fundraiser for Baker in Boston Thursday night. Republican Charlie Baker has momentum as the race for governor in Massachusetts enters the final month. It raises the question: Could Martha Coakley lose another big election? Several recent polls have found the race for governor in Massachusetts is a dead heat between the major party candidates with three independents registering in the low single digits. A double-digit lead Coakley once had over Baker has now evaporated.